I am working on a simple 24-hour clock based on the CD4017. 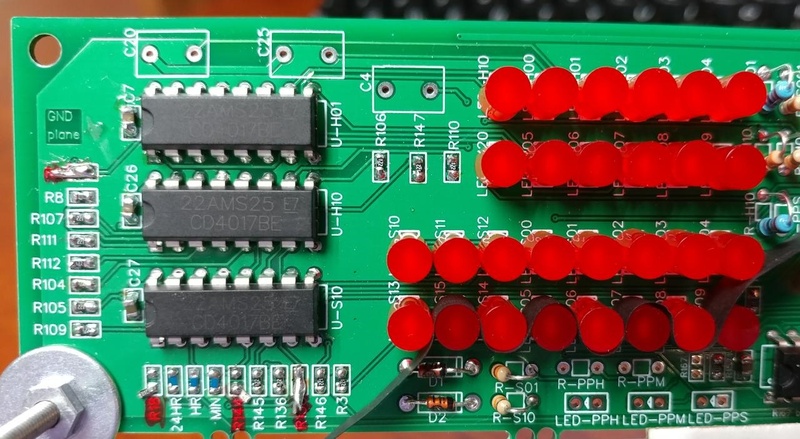 To reset when the clock reaches the 24th hour, two diodes are used to produce an "and" logic when the 2 digit and 4 digit LEDs receive a high output from the CD4017. The output from these diodes are connected to the reset pins of both CD4017 chips. What I have found happens in practice is that the U-H10 chip resets as expected, but the U-H01 chip does not. I imagine this could be due to a delay in the signal due to differences in trace lengths (maybe 10-20mm) and or placements somehow creating a tiny RC effect. (One has more vias than the other.) 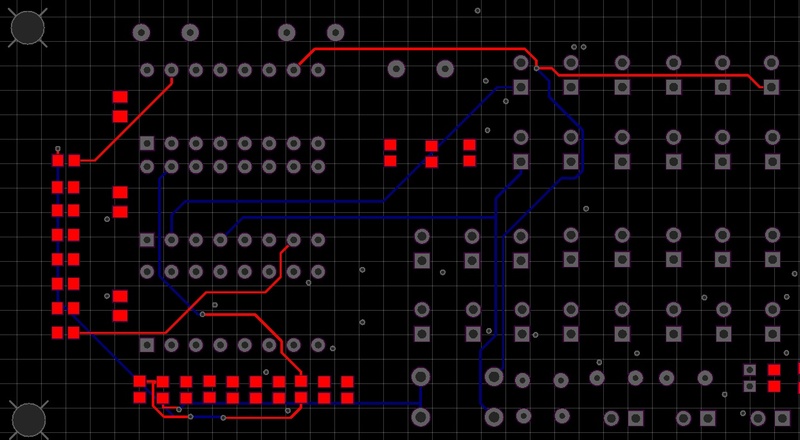 I tried adding a small cap, shorting resistors R138 and R6, as well as removing R18 (on an etched PCB, not a breadboard.) I also checked the reset (pin 15) of U-H01 and it does not APPEAR to be shorted to ground. Has anyone else faced a similar problem? Ideas? NOTE For those unfamiliar with the CD4017, the reset is high, not low. From the TI datasheet "A high RESET signal clears the counter to its zero count." Therefore a monostable circuit that is waiting for a falling edge voltage to trigger will not work in this application without using an inverter. You're using a "glitch" to reset your counters. In other words, when the reset pulse starts, it immediately removes the conditions for its own creation, so it's only as wide as the propagation delay through one of the counters. Clearly, one of those counters is faster than the other, so it resets successfully, while the other does not. This is why this is considered poor design practice, and why synchronous counting was invented — it only works under certain conditions. The fix is to use the glitch to trigger a monostable timer (e.g., half of a 4098) that will guarantee the minimum reset pulse width for both counters. The reset won't occur until the timer is successfully triggered, by which time, it doesn't matter if the glitch goes away. I see that you have removed R18's connection to ground, but I don't see any other provision to pull that node high. If that node is just floating, then you're just getting capacitive coupling and/or leakage current through the diodes for your reset pulse, compounding the problem. Turns out the 1N4148 diodes were placeholders and not updated. The design was experimental and was supposed to have a 4.5v zener (Nexperia NZX4V3D,133) which I am not sure would have worked anyways. Since that didn't actually solve the problem, I dug further and found the diode specification when checking the reference design this was based on. Lacking the 4.5v zener, I used a very nice AND circuit with a few 2N2222s I had lying around. It works nicely now. For future reference, I disabled the 555 circuit and the reset works just fine, apparently the propagation delay wasn't the issue after all. I'll leave it in place since it is a better design. R18 should go to Vdd, not ground. Otherwise the RESET line will never go high (the diodes can only pull it low). Edit: Depending on the logic family you are using, there may be enough diode and stray capacitance in the diodes to cause false resets. Assume HC logic you can shunt R18 with about 20pF. And make sure R18 connects to Vdd (+5V). For a one-time design you can fix this by increasing the resistor in series with the reset pin of the faster IC , R138 in this case. I would use 10K, leave R6 unchanged. (And use the pull-up resistor others have mentioned.) For a production run you probably have to use a one-shot. Edit: I have realized that this won't work here as you are gating outputs of two counters. This is a probable fix: reset H10 as wired and use the rising edge of the zero output to reset H01. 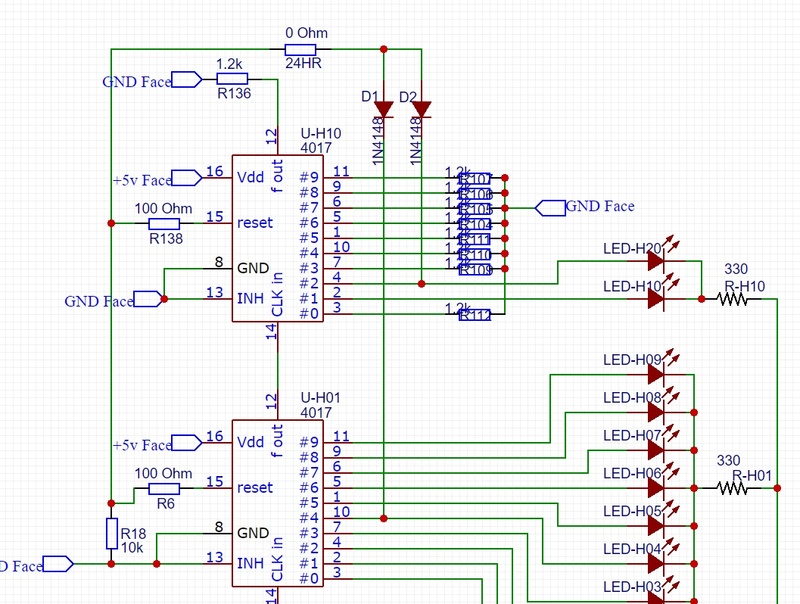 Replace D2 with a resistor, cut trace between counters so pull down resistor is still connected to counter H01, then wire a low value capacitor from the zero output of H10 to the reset input of H01. Not the answer you're looking for? Browse other questions tagged diodes clock counter reset cd4017 or ask your own question. How to use Counters ONLY to construct a School Bell circuit? Why does my DIY Barebones Arduino Due with SAM3x8E overheat on RESET press?